Andromeda restaurant in Nessebar is the place to impress your dinner guests with fantastic views or to enjoy a glass of excellent local vine while listening to the endless sound of waves. With multiple terraces descending toward the sea and beautifully restored interior, it arguably offers the best restaurant sitting in the old town Nessebar. According to Andromeda’s FB page, they specialize in seafood, pizza, Greek and mediterranean cuisine. Tripadvisor ranks it as #2 restaurant in Nessebar. Confusingly, our personal dinner experience was err… a disjointed one. After a long day of driving from Sofia, visiting Plovdiv and discovering Nessebar, we’d been ready to eat a horse, well, of course, metaphorically speaking. Andromeda restaurant was just a couple steps from our hotel, so it was a no-brainer going there. The ambience was lovely, the sea view was enchanting and the menu was extensive. We wanted to try the local wine, but, been unfamiliar with Bulgarian wines yet, we asked our waitress for a recommendation. Her choice perfectly matched what we wanted: a light semi-dry variety from a local winery. Encouraged by this success, we ordered the rest of the dinner. Unfortunately, I do not remember exact names of the dishes and I could not find Andromeda’s menu online, so I describe what we ordered in layman’s terms. First, as an appetizer, we tried sautéed mushrooms. They were perfect: not overcooked, flavorful and seasoned just right. Visiting the sea coast and not trying what it can offer is out of the question. Hence, our second choice of appetizer had plenty of fishes in its description. It ought to be an array of tasty snacks. The plate arrived and… it was a surprise. First of all, judging by the size of it and the amount of fish piled up there it was definitely meant for more than 2 eaters, even hungry ones. However, that was the least of our problems. There were different varieties of fish on that plate, from tiny ones, just a couple inches long, to something that we identified as some variation of salmon, however I can not be 100% sure if we were right. They all had one thing in common: they were so salty that it was difficult to swallow. In my humble opinion, this fish was supposed to serve as something to bite after drinking vodka (zakuska, maybe?). Otherwise, it just did not make any sense since our poor taste buds went numb. After that, nothing really mattered. The next course could be prepared by a 3 Michelin starred chef or by a complete food charlatan with the same result: we would not be able to detect any difference. 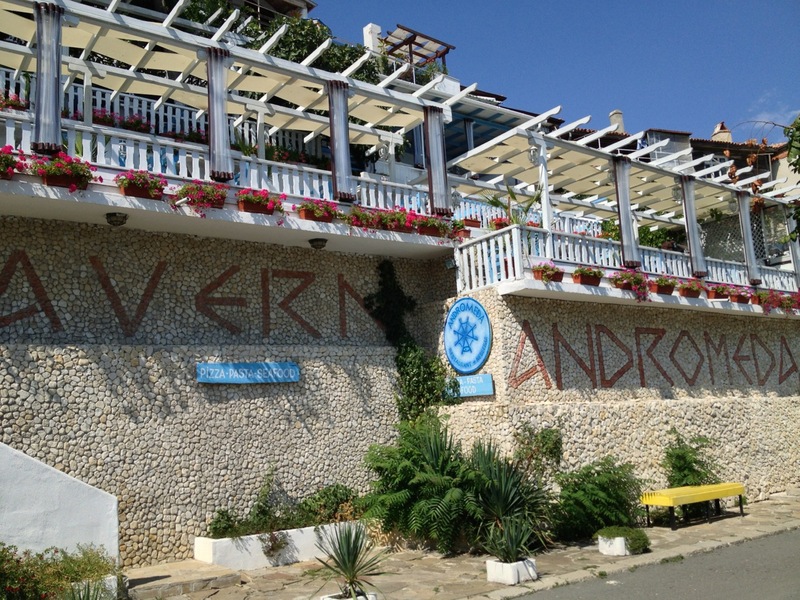 Apparently, Andromeda restaurant positions itself at the higher end of the Nessebar food scene. As such, I would expect their service to match this aspiration, which, in turns, means that the staff should care about dining experience and, perhaps, advise their customers about food choices. Foreigners, like us, could be unfamiliar with their menu and misunderstand some descriptions. It would be great to encounter a waiter who unobtrusively indicate a questionable choice or suggest a better pairing.